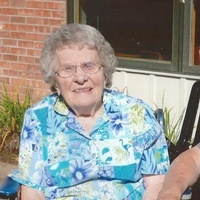 Bernice Anna Kindschy, age 89, of Whitehall, died on Saturday, December 22, 2018 in the Grand View Care Center in Blair. Bernice was born on May 1, 1929 to Arthur and Lorena (Iberg) Kaste. She was born and raised on the homestead farm located in the town of Lincoln, Buffalo County, WI. Bernice graduated from the Alma High School and was employed as a secretary for the lumber yard in Winona. Bernice married LaVerd Kindschy of Whitehall on September 26, 1953 in the Harold Methodist Church in rural Alma and were married for 65 years. Together they farmed in the Whitehall area until 2007 when they moved to Whitehall. Bernice was a loving wife, mother and grandmother. She loved the Lord and lead a Christian life. Bernice is survived by her husband, LaVerd; a daughter, Diane (Fred) Nehring of Whitehall; her grandchildren and their families, Andy (Julie) Nehring of Whitehall and their children, Micah, Evan and Matthew; Nick (Joanna) Nehring of LaGrange, GA and their children, Julia, Amos, Isaac, Titus, Silas and Mary Jo; Tony (Michelle) Nehring of LaCrosse and their daughter, Lola; Cathy (Aaron) Triphan of Green Bay and their children, Caleb and Tirza; Wes (Caitlin) Nehring of Menomonie and their children, William, Isabella and Adeline; Angie (Zack) Szyman of Minneapolis, MN and their son, Jaydon. In addition to her parents, Bernice was preceded in death by a son, Curtis; two sisters, Lucille (Willard) Kennen and Wilma (Roy) Risch and two brothers, LaVern and Hilbert Kaste. Funeral services will be held on Friday, December 28, 2018 at 11:00 a.m. in the United Methodist Church with burial in the Lincoln Cemetery both in Whitehall. Pastor Tom Elliott will officiate. Visitation will be Thursday, December 27, 2018 from 5-7 p.m. in the Jack Funeral Home in Whitehall and also one hour prior to the service at the church on Friday. © 2011 - 19 JACK FUNERAL HOMES LTD. All Rights Reserved.